← Book your holiday in Santa Fe! Have a Rejuvenating Winter Getaway in Santa Fe! Most people tend to think that the Southwest is hot and dry all year round, but here in Santa Fe, we have the most beautiful winters. 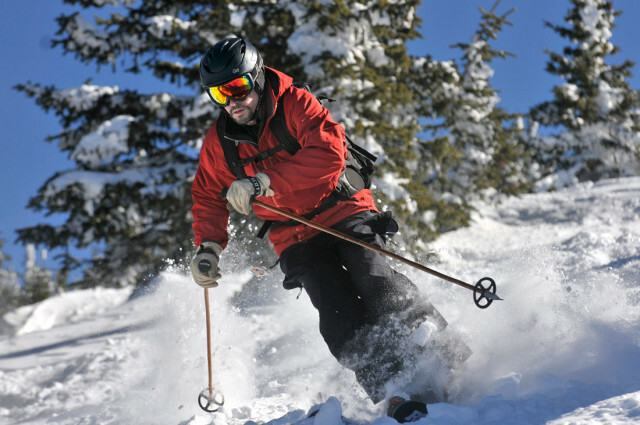 At the southern tip of the Rocky Mountains, we have some of the best skiing in the area. But when you combine that with the unbeatable hot springs & spa experiences that Santa Fe is also known for – you will definitely come for the skiing, but stay for the après ski. Ski Santa Fe, only 16 miles from Santa Fe, is a great mountain for bunny slopers to those who crave double black diamonds. With 77 trails and over 1700 vertical feet of trails – you’ll need more than one day to get your fill. Bring your gear or rent! There are plenty of packages available for all skill levels. Once evening comes and the lifts shut down, it’s time to wind down with an après ski to beat all others. Picture yourself relaxing in a private hot tub or sauna to melt away the stiffness and soreness of a day on the slopes. At the foothills of Ski Santa Fe is Ten Thousand Waves, a japanese-inspired spa that will sweep you off your feet (even more than the chairlifts!) Open until 9:30 PM during the week and 10:30 PM on Friday and Saturday nights (holiday periods have a different schedule, please refer to their website for details), you can soak all your cares away. Take advantage of their other spa services too – slough away that dry, dull skin with a salt scrub, treat yourself to a relaxing massage – the possibilities are endless. Or, if winter sports aren’t your thing, you could have a winter spa getaway and check out even more of the hot spring action Santa Fe has to offer. 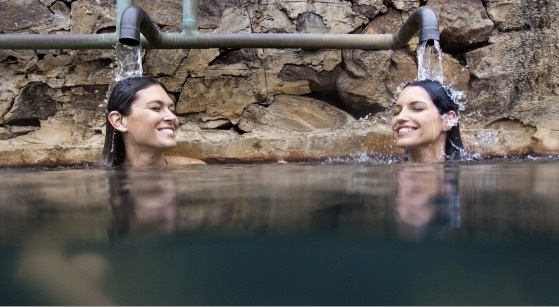 Once you’ve exhausted the services at Ten Thousand Waves, check out the different mineral baths at Ojo Caliente, one of the oldest natural health resorts in the USA. Opened in 1868 on a site known for its restorative waters, people have been returning to Ojo in droves for hundreds of years to experience the baths themselves. With yoga classes, tibetan monks, and miles of hiking trails, you are sure to find peace and health at Ojo Caliente. Situated in the historic district on Garcia Street, this large family home was built in 1990 and is a true Santa Fe contemporary home with two fireplaces and brick floors throughout the upper level. It is a two story home with a large open kitchen/dining room with fireplace and breakfast nook. This large home is perfect for Holiday or summer gatherings. 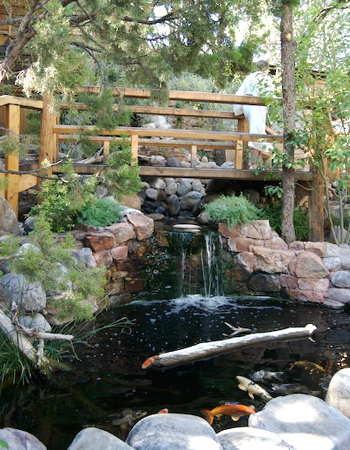 It is a short stroll to Canyon Road or the Santa Fe Plaza and just minutes from Museum Hill. Located in the prestigious Betty Stewart Compound just one block from the galleries of Canyon Road and an easy 15-minute stroll to downtown’s Santa Fe Plaza, Casita de Sol is a lovely single-floor home with two spacious bedrooms — each with its own fireplace and remodeled bathroom. This vacation home is ideal for the discerning traveler looking for accommodations for one or two couples. Authentic eastside compound of two casitas on Palace Avenue. Almost identical two little houses with hardwood floors. Each property has two bedrooms and one full bath. The bedrooms offer a king and a queen and each has a Flat Screen TV. Professional décor, wonderful linens, patio/garden with sitting areas for outdoor dining, BBQ, market umbrella. For a romantic get-away, you can rent one property or for a larger gathering or reunion, you can rent the compound and sleep eight guests in comfort. This entry was posted in Winter Rentals and tagged Ojo Caliente, santa fe hot springs, santa fe spa, Santa Fe Vacation, santa fe winter, ski santa fe, spa vacation, ten thousand waves, Winter Vacation. Bookmark the permalink.